"Mama Mia! 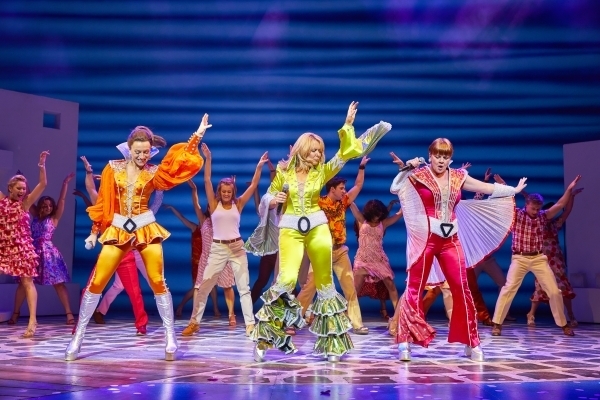 ", the smash hit musical, based on the music of ABBA, kicked off a month-long long at His Majesty's Theatre this week. Actually, it high kicked, it shimmied and it absolutely shone! Written by "the boys in the band", Benny Andersson and Bjorn Ulvaeus, now both in their 70s, Mama Mia! has been playing somewhere in the world since 1999, and spawned an equally successful film, too, in 2008. Like many, I'd seen the movie, with it's starry line up, including Meryl Streep, Pierce Brosnan and our own National Treasure, Julie Walters...but would the stage version still appeal? Have to tell you I'm not a huge fan of musicals - it's got to be something special to make me flip my lid..."Wicked" - Yes, Sunshine On Leith - slightly more awkward "Yeeeees"...but I cannot rave enough about Mama Mia! On stage, with live singing, the slightly shoe-horned inclusion of so much of ABBA's glorious back catalogue seems more natural. In my (tone-deaf) opinion, the singing is definitely better...Pierce Brosnan, in the movie version, may be a natural as James Bond, but he's not a natural chanteur! Whereas the present cast of this stage show are strong in both voice and dance. In fact,the dance routines, particularly the whole ensemble set pieces, are simply wonderful; faultless choreographed, beautifully performed, exciting to watch and totally incorporated into the storyline, rather than a needless intrusion into the plot, as can be the case in lesser musicals. From the opening announcement of, "We would like to warn patrons of a nervous disposition that platform boots and lycra feature in this production", the audience is swept into life on a Greek island, 1990-ish, where the plot centers round a wedding of a 21 year old girl (for she is, definitely, "girlish"), whose quest for the identity of the Dad she has never known, brings the three "potentials" onto the island - and into the action. Mother of the Bride has refused to discuss daughter's paternity for the past two decades but is suddenly confronted with the need to do so; and do it in the fraught lead up to this wedding! Luckily, she has the support of her two besties, who were one-time members of her "Donna and The Dynamos" trio, and also arrive on the island for the approaching nuptials. Cue lots of potential for confusion...and even more potential to burst into an ABBA song. Or ten. The Winner Takes It All; Knowing Me, Knowing You; Money, Money, Money; Dancing Queen: all the favs are there. Of course, the beauty of ABBA's large and catchy repertoire means that it is still known and loved by getting on for three generations - certainly, the audience on the second night of a four week run was the biggest cross section I've seen in HMT for a long time. Literally, kids, parents, grandparents...mixed in with lots of big groups of chums clearly believing themselves liberally rewarded during "Lay All Your Love On Me" when the groom's chums disrobe to go snorkelling. They are undoubtedly "ripped" as my companion said, and undoubtedly appreciated by the woman next to us who, you could say, "Won't see 70 again"! All in all, an excellent production, a lovely family, chums or couples night out, at HMT til 14th October...don't let the opportunity to catch it be "Slipping Through Your Fingers". And feel free to get up and dance at the end, you normally reticent Aberdeen Audiences. We did. And so did everyone else. It was, simply, great fun. Mama Mia! All I can say is Thank You For The Music. And the dancing...and the laughs. Superb night out - not to be missed!